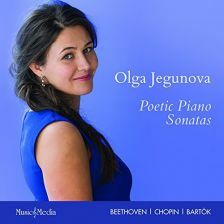 Poetry and music make for natural bedfellows and so Olga Jegunova’s generally pleasing programme of ‘Poetic Piano Sonatas’, in this context Beethoven, Chopin and Bartók – an unusual juxtaposition to say the least – is thoughtfully supplemented by chosen (printed) texts by Goethe, Pasternak and Abigail Parry. Whether you can marry the words to the music is something else, but it’s worth a try. Jegunova’s performances are at their best in the slow movements, the Waldstein’s Adagio molto thoughtfully poised with some sensitively calculated pauses, the transition into the closing Rondo achieved as if on the edge of a dream. This really is excellent playing, poetic indeed. In Chopin’s Second Sonata, it’s interesting that for the repeat Jegunova, like Maurizio Pollini, shoots straight back to the movement’s Grave opening rather than opt for the more familiar option of returning to the Doppio movimento faster section (as, say, Horowitz, Simon Trpčeski, György Sebők and Vladimir Ashkenazy do). Not that it matters too much, but what does matter more, at least in my view, is Jegunova’s tendency to bend the line with uncomfortably conspicuous hints of rubato, especially in the outer sections of the scherzo, while the Funeral March, although well played and tonally smooth, lacks climactic tension, and the ghostly Presto that follows it suggests, if I may poach a poetic allegory ‘choice’ of my own, a state of drunkenness ‘so as not to feel the horrible burden of time’ (Baudelaire). Any sense of blood-draining nocturnal fright is entirely lacking. The Bartók Sonata’s first movement is again fairly free but Jegunova makes next to nothing of the contrasting dynamics; the various sforzandos, fortissimos, fortes and pianos all inhabit an even plain and the music comes across as tame. Again, the slow movement is best, while the finale projects a genuine sense of play. There’s so much to admire here, specifically in terms of Jegunova’s vivid musical imagination, that I’d like to hear her playing in a live or at least a broadcast context, maybe a couple of rounds with this particular programme. As to the CD under review, a bit hit or miss, but evidence enough that Olga Jegunova is a name to watch.